Eadlyn doesn't expect her story to end in romance. But as the competition begins, one entry may just capture Eadlyn's heart, showing her all the possibilities that lie in front of her... and proving that finding her own happily ever after isn't as impossible as she's always thought. When I found out there was going to be another book in The Selection series I was seriously stoked. I absolutely love this series and I thought The One was going to be the last book. Luckily, Kiera Cass surprised us all with two addition books for the series, except this time they are told years after The One and in a different point of view: America and Maxon's daughter's. For a Christmas present my little sister in my sorority pre-ordered the book for me and she gave it to me on the release day. I honestly couldn't help myself and I had to start reading it that night. I would have finished it one sitting, but exhaustion got the best of me so, I finished the last 100 pages before going to work the next morning. It was seriously that good. I'm a little mad at myself for finishing it so fast, because who knows when the last book will release. It could be a year from now, but I am happy I enjoyed it so much that I couldn't help myself. In the very beginning of The Heir I didn't really connect with Eadlyn. She comes off very cold and uncaring. However, as the story goes on we learn that it is just a defense mechanism to make sure nobody gets too close. Eadlyn is actually a very loving girl who wants the same thing her parents have, but she doesn't want to appear weak. She is the first ever female heir who will take the throne and that puts a lot of pressure on her shoulders. I loved how hard she fought to not have a Selection, and I loved how hard her parents fought back to have one. Luckily, through negotiations, she finally agrees to have one. The guys that get selected are seriously great guys. 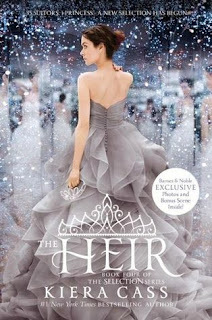 There is only a handful left by the end of The Heir, but they are seriously the best of the lot. I don't who she will pick, but I do have a theory that I won't share. As with all the other books in the series the writing is addictive. I found myself laughing, crying, shocked, and being wooed. I could not put it down and I was so sad when it ended. The book really packed a lot into it, but it didn't pack enough of the Selection process to know which way Eadlyn is swaying. I cannot wait to get my hands on the next book to find out what she decides to do. She could pick one that will love her, one that will be there for looks, or no one at all. Ah! I can't wait! I absolutely loved this addition to the series. I was so excited to find out that there would be another book in the series, even more excited to find out it was from the female heir's point of view, and somehow even more excited to learn that there will be one more book after this one. Eadlyn was a little hard to love in the beginning, but once her walls came down to the reader she was absolutely stunning. I loved getting to know her, and getting to know the guys she has to pick from. It was so excited to not only hear from a different person's point of view, but the person doing the selecting point of view. I got The Heir on release day and had to read it that night. By the next afternoon it was finished. I'm a little upset I read it so fast since there is probably a long wait till the last book, but I'm so happy I loved the story so much. I only have a small clue who she will pick, but I have noticed that Eadlyn isn't very predictable. I cannot wait to see what is in store.